Integrated Innovation: Fostering the New Growth.. The pharma landscape is constantly changing, especially as many players in the industry move toward slimmed-down in-house R&D. This includes embracing the “growth pharma” model in which drug discovery programs are obtained via acquisitions. Many big pharma executives have left their posts to spearhead lean, high-risk, high-reward biotech firms, start-ups and virtual companies, which lack wet labs and other means of obtaining experimental results. But one can argue that the recent upsurge in smaller biotech firms came before the industry was adequately equipped to handle the substantial outsourcing these firms rely on. Icagen has been anticipating the industry’s arrival of growth pharma over the aged big pharma model, and has uniquely positioned itself to be the industry’s incubator: a one-stop shop with a completely integrated drug discovery program, one that moves beyond the fractured outsourced model of specialized CROs and into a true partnership for biotech firms looking to innovate and grow within the pharmaceutical industry. Icagen’s acquisition of Sanofi’s Tucson facility in mid-2016 changed the face of the company. This move transformed Icagen from a highly specialized CRO into North America’s first truly integrated drug discovery contract research organization. This was achieved by introducing the broad scope of the Tucson facility’s drug discovery program to the rigor of a highly specialized North Carolina site that has spent nearly a quarter of a century, with essentially the same core team, trying to unravel one of the more difficult drug discovery targets: ion channels and transporters. The acquisition of the Tucson facility added chemistry, structural biology and in silico approaches for early drug discovery to the North Carolina site’s top-of-the-industry biology. Adding Icagen’s meticulous knowledge of ion channels and transporters to the Tucson facility’s integrated approaches is already starting to transform the way the company pursues a wide range of targets. For example, Icagen’s deep knowledge in ion channel biology is now married to an expertise in Tucson for patient-stem-cell–derived skeletal and cardiac muscle models. In the current fractured model of outsourcing, a company must rely on different CROs to put together a drug discovery program. For example, a pharma company may contract one organization for early drug discovery via in silico approaches, and several others for medicinal chemistry and biology wet labs. 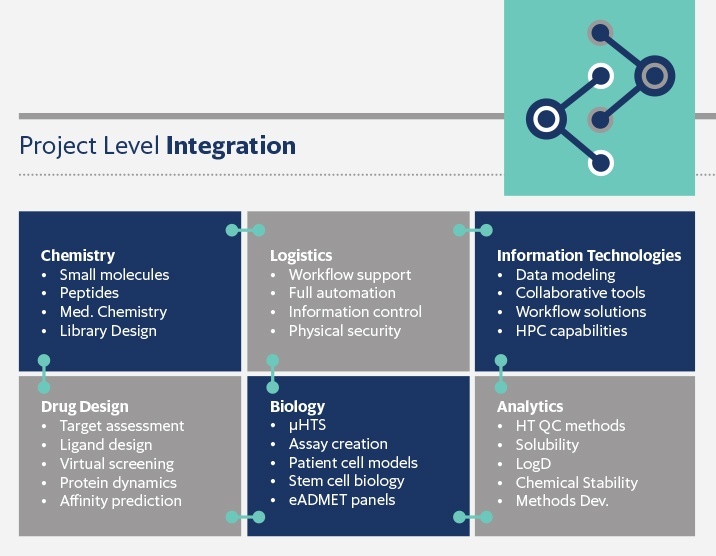 At Icagen, all of these services are provided in a fully integrated drug discovery program that is capable of adaptive learning, as Icagen’s lattice of biology, chemistry, structural biology and in silico modeling interface with each other continuously throughout the program. Real-time research optimization not only increases efficiency, ultimately it enables Icagen to be a better partner — especially because of the crosstalk that happens between the sciences. Biologists thinking about chemistry, and chemists thinking about the implications for biology, create a unique form of translational science that cultivates novel approaches to drug discovery, one where in silico simulations turn into promising compounds. At Icagen, a partner will find everything they need under one roof, in addition to a different kind of scientist. Scientists at Icagen not only have strong expertise in their field but offer a unique translational knowledge of all fields, demonstrating that true integration leads to the discovery of strong drug candidates. In the fractured model, a company must wait on results from one CRO before moving to the next — at best creating 'white space’ in programs, at worst missing key insights between disciplines. At Icagen, drug discovery occurs in a web of biology, chemistry, structural biology and in silico modeling, in which reevaluations and readjustments happen seamlessly and in real time. In a changing industry model that increasingly embraces ‘growth pharma,’ guidance and expertise are needed more than ever. In many ways, Icagen sees itself as this new industry’s incubator. Not only is Icagen a fully integrated drug discovery CRO, Icagen is a think tank that houses industry leaders in every realm of drug discovery. This means better results in less time, especially when the real-time research optimization of the integrated drug discovery program at Icagen is compared to linear and other fractured models of CRO outsourcing. Furthermore, Icagen's two facilities — in Tucson and North Carolina — mean that it is not necessary for potential partners to maneuver time zones, language barriers and corporate cultures that can create costly disruptions in getting drug candidates to IND. Grant, “The Problem With Lilly Is the Problem With Pharma.” The Wall Street Journal. Dow Jones & Company, 23 Nov. 2016. Web. Loftus, “Eli Lilly Alzheimer’s Drug Fails Trial.” The Wall Street Journal. Dow Jones & Company, 23 Nov. 2016. Web. Alsever, Jennifer. “Big Pharma Innovation in Small ” Fortune, 12 May 2016. Web. Whalen, Jeanne. “Virtual Biotechs: No Lab Space, Few ” The Wall Street Journal. Dow Jones & Company, 04 June 2014. Web. Hayden, Erika “The Automated Lab.” Nature. 516 (2014): 131-132. Web. Herper, Matthew. “This Giant Drug Firm Won’t Invent Investors Are Cheering.” Forbes Magazine, 9 Feb. 2015. Web. Grant, “Big Pharma’s Big Checkbooks Drive Biotech Resurgence.” The Wall Street Journal. Dow Jones & Company, 21 Sep. 2016. Web.